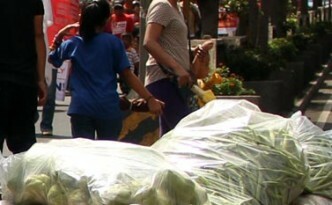 BAGUIO CITY — Hundreds marched in the city center to commemorate International Labor Day. The March was led by Kilusang Mayo Uno (May First Movement) Cordillera. “Fight for a National Minimum Wage,” chanted the workers. 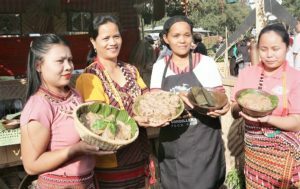 BAGUIO CITY — In an interview with Vicente Dilem, Kilusang Mayo Uno (May Day Movement) Cordillera Spokesperson said they are marking Labor day, on May 1, 2016, with the call for a nationwide, across-the-board increase of the minimum wage to P750. He said that the different regional minimum wages in the country are not enough to sustain the needs of the average family of five. Malayo na ang narating ng ating kilusang manggagawa sa pagpapa-unlad ng kalagayan sa mga pabrika, sama-samang pagkilos upang itaas ang sweldo at benepisyo at patuloy na ipaglaban ang kapakanan ng mga maggagawa. Nakakalungkot nga lang na mas tuso talaga ang mga kapitalista at kasabwat nilang mga otoridad sa gobyerno. Nakaro ken kumarkaro pay ti panakagundaway ken panang adipen kadagiti mangmangged. Nasaknap ti implementasyon ti kontraktwalisasyon iti naduma-duma a pribado ken pampubliko a sector. 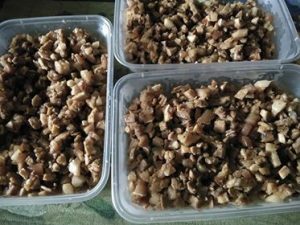 Iti pribado a sector, kas iti minasan ken dagiti pabrika iti Export Processing Zone ti Baguio City ket 2/3 iti rank and file employees ti kontraktwal. Iti service sector kas kadagiti empleyado ti hotels, inns, restaurants, grocery ken department stores ken dadduma pay mainayon dagiti call center ken dagiti ESL ket contractual ti kaaduan nga empleyado. Saan a nailaksid dagiti empleyado ti gobyerno, adu met lang iti bilang ti kontraktwal ta inpatungpal ti gobyerno ti agduduma a porma ti kontraktwal. 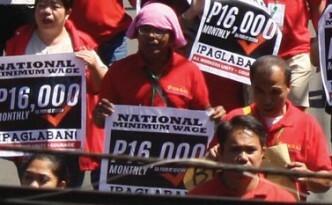 BAGUIO CITY — The Confederation for Unity, Recognition and Advancement of Government Employees (Courage) vowed to intensify the demand for a National Minimum Wage and fight against contractualization amidst the escalating threats against progressive unions during their 10th national congress held at the Teachers Camp, here on April 5. Contractualization, is a labor hiring scheme invented in favor of capital and the capitalists to ensure their continuous raking-in of profit. Being a contractual worker is like being a disposable item that can be thrown away when it is no longer useful or something that can always be replaced whenever the owners want to. VIGAN CITY, Ilocos Sur – Eighteen years after 160 members of the Times Employees Union (TEU) held its first strike in March 1997 and more than five years after the Supreme Court ruled with finality in favor of the workers, justice remains out of reach for its members. LA TRINIDAD, Benguet — Engineer Lomino Kaniteng representing the Benguet Federation of Small-scale Miners, Inc (BFSSMI) filed a complaint against Secretary Ramon Paje of the Department of Environment and Natural Resources (DENR) for allegedly exceeding his authority on the issuance of Administrative Order No. 2015-03 or the revised implementing rules and regulations (RIRR) for Republic Act 7076 or the People’s Small-scale Mining Act which the complainant said runs counter to RA 7076 itself and The Constitution. BAGUIO CITY — Kilusang Mayo Uno (KMU) Cordillera Spokesperson Vicente Dilem said that the Cordillera labor movement remember and miss the most down-to-earth lawyer who selflessly dedicated more than three decades of his life to serving the toiling masses especially the poor workers in the Cordillera Region and other places of Luzon. BAGUIO CITY — The grim death of the 72 workers who were trapped in the burning building of Kentex Manufacturing Incorporated shows how capitalists with the consent of the government itself prioritize profit more than the value of human life said Agrofoods Employees Union-National Federation of Labor Unions-Kilusang Mayo Uno (AFEU-NAFLU-KMU) President Rodel Laroza.